Dave’s Chillin’ and Grillin’ is a site that will be featured again on this site in the not-too-distant future. The eponymous proprietor of this particular establishment is a Boston transplant who, dismayed that he was unable to find a quality sandwich in Los Angeles, set up shop in the Eagle Rock neighborhood. Dave’s is the closest sandwich establishment to my residence, and luckily one of the best. As I headed into Dave’s yesterday, I noted that the chalkboard on the sidewalk listed specials for Tuesday through Friday, leading me to believe Monday had no such featured sandwich. Still, I verified this was the case at the counter, and was told that today’s special was the “Surf and Turf.” I was then informed that this was a tuna and pastrami sandwich. I imagine my eyebrows must have leaped nearly off my forehead. Not only did this sound like a sandwich so interesting that I simply had to try it, but it allowed me to test my newly-minted theory that pastrami was the perfect complementary sandwich meat. I felt that if anything would stretch the theory to its limits, it must be this. The Surf and Turf was basically a tuna melt with pastrami, as touted. Tuna salad, pastrami, tomato, and cheese sauce grilled on white, with Dave’s signature red pepper spread. On my first bite, I was disappointed. But then I paused, and thought about a normal tuna melt. This was markedly better. I suppose I expected the sandwich to be transcendent, but armed with my new point of reference, my theory held up, and I was treated to a very fine sandwich indeed. The pastrami was indeed a fine counterbalance to the tuna, which itself was a step or two above most sandwich shops. Nice, large chunks of tuna, light on mayonnaise, and with a healthy dose of pepper. If I were to construct this sandwich myself, I would do things just a bit differently. I feel that the cheese sauce would work better if it were replaced by actual slices of cheese. I feel that the inclusion of tomato, if it must be added, would only benefit with adding either onion or lettuce, or both, after the two halves of the sandwich came off the grill, for a true snap and added texture. My final quibble is, I feel, merely a byproduct of having partaken of Dave’s so often. His patented red pepper spread, which really makes his meatball and his sausage subs something unique, was good on this sandwich, but perhaps just a soupcon of overkill. A solid brown or whole-grain mustard would have been just as good, and wouldn’t have overwhelmed the meats quite so much. But overall, a lovely surprise of an unorthodox sandwich. I imagine I’ll find a reason to return on a Monday soon enough. 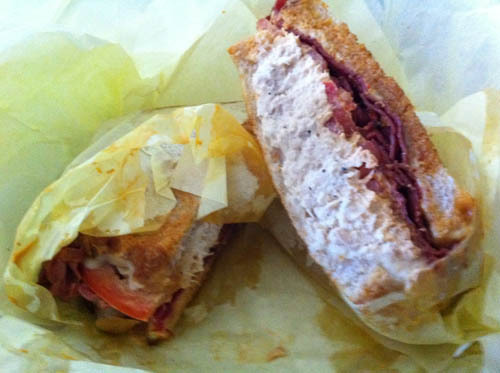 This entry was posted in General Sandwich Discussion, Sandwich Reviews and tagged Los Angeles, Reviews by Bill, Sandwiches I Have Eaten, Tuna by bengrimm. Bookmark the permalink. perhaps instead of putting it together, it could’ve been open-faced and then the tomato would have been just right! Like in a real Tuna-melt! Thanks for the fun posts! If it were open faced, though, it would not be a sandwich. Just to clarify, Dave’s has never served cheese sauce. Only non processed real cheese sliced fresh.